The topics of pollution and waste in German-language writing reach back to the nineteenth century, when the production of industrial waste—and pollution of the air, ground, and water—first began to occur on a massive scale. The beginning of the nineteenth century was still relatively free of waste in the modern sense of the word. Farms, private households, and even larger factories did not produce waste as we know it today. Plastic had not been invented, there were no single-use containers, cheap imported goods, or fossil fuel-based products, and common people just did not have houses full of “stuff.” Objects, clothes, and other artifacts would have been reused. There was no organic waste either, as all food scraps were used for meals, were composted, or fed to farm animals. A mountain of garbage. Photograph by Ger1axg. Accessed via Wikimedia on 6 September 2018. Click here to view source. One way of conceptualizing pollution and waste is to think about these processes in terms of open and closed cycles. To avoid waste and pollution, the aim is to keep everything that is produced within a closed cycle, in which nothing gets lost and all materials are reused. This is the basic idea behind the “cradle to cradle” concept, which is based on the premise that in healthy cycles, all natural products function as nourishment for something else and don’t need to be separated and recycled. Michael Braungart and William McDonough pioneered this idea in their 2002 book Cradle to Cradle: Rethinking the Way We Make Things. Literature can often register the phenomenon of open cycles, and the related problem of waste production. The realist poet Wilhelm Raabe was the first writer to tackle the theme of waste and pollution in German literature toward the end of the nineteenth century. In Pfisters Mühle (Pfister’s Mill), a novel about a mill and its economic decline, Raabe draws attention to the increasing problems caused by industrial waste that is dumped into the local streams without regulation or legal consequences. Raabe tells the history of a stream that feeds a mill. Over the course of the story, more and more signs of pollution appear. This eventually forces the mill owner out of business. The source of pollution is a sugar factory which dumps its wastewater upstream, a practice that causes the rapid growth of bacteria in the water. In his novel, Raabe illustrates the problems with open cycles and the breaking apart of formerly closed cycles. As pollution increased throughout the twentieth century, German literature began to focus more directly and openly on waste and toxic pollution. The German critic Walter Benjamin, who fled from the Nazis and took his own life at a Spanish port just before embarking on a vessel for America, composed a series of philosophical theses on the concept of history in 1940 shortly before he died. In these theses, he laid the foundation for a theory of the (historical) waste that is produced in a society struggling with problematic and complex historical processes. 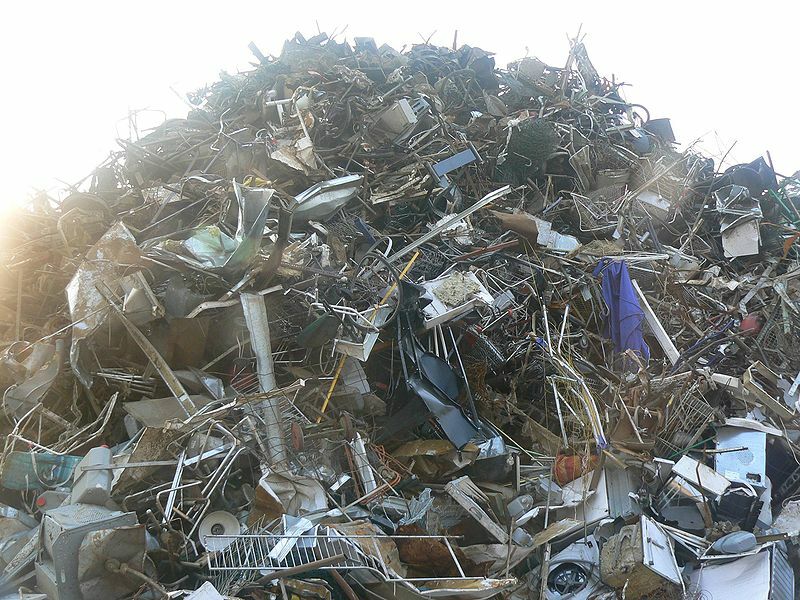 These processes are rooted in a culture of dumping, separation, storage, and waste removal. As Benjamin imagines his figure of the angel of history who is completely helpless in face of the constantly growing heap of waste in front of him, he also creates an allegory of the open cycles and the toxic production processes embraced by modern society. Postwar literature no longer only addresses the problems of pollution and waste metaphorically or allegorically. It also openly addresses the processes of separation and waste removal and even radicalizes them by showing how humans participate in these cycles and become waste themselves. The German filmmaker, actor, and playwright Rainer Werner Fassbinder was known for his experimental theater work and his involvement with New German Cinema. Fassbinder painted a bleak picture of German society in the seventies, one that embraced economic development at all costs. In his play Garbage, the City, and Death, Fassbinder used the example of the Frankfurt banking quarter where skyscrapers replaced an old and traditional neighborhood in which humans had resided and made their livings for centuries. These humans therefore become waste in a system that creates poverty and relies on speculation in the never-ending search for profit. In a similarly critical take on society, a poet and playwright of the German Democratic Republic, Heiner Müller, wrote a play based on Medea, which takes place on the shores of a completely polluted East German lake outside of Berlin. 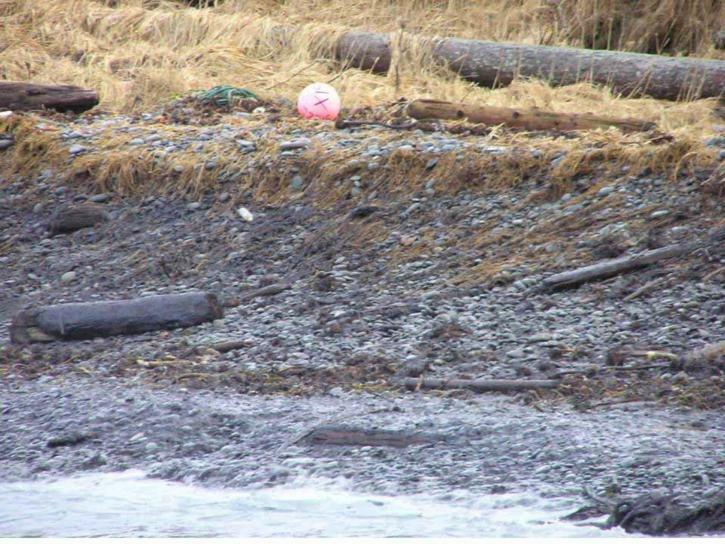 The shore is littered with industrial and human waste, and is not fit for human habitation. Müller focuses on the figure of Medea, who cuts up her children and serves them to her husband Jason in order to highlight the processes of waste production that lie at the core of modern societies. These powerful literary images and philosophical concepts illustrate the violence that is inherent in the production of waste. These open processes can have devastating consequences for the environment, and the humans who live in these environments. Nineteenth-century novelist Wilhelm Raabe’s Pfisters Mühle (Pfister’s Mill), 1884, is perhaps the earliest German-language literary source to tackle the subject of pollution. In this novel, a miller is struggling with the consequences of the chemical pollution of his stream due to toxic wastewater dumped upstream by a sugar factory. In the end, even though he wins his case in court, he is nevertheless so exhausted from fighting this problem that he gives up his business and hangs his miller’s axe up on the wall. 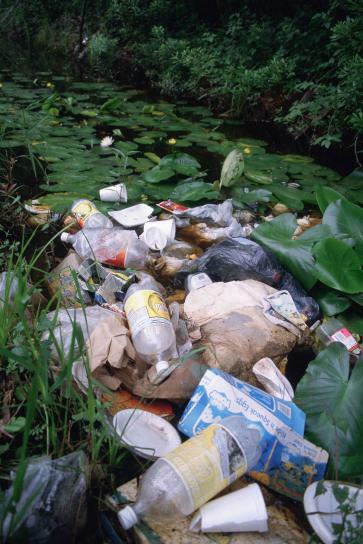 Water polluted with tin cans and other garbage. Photograph by Luther C. Goldman, U.S. Fish and Wildlife Service. After he dies, his son Ebert Pfister—who teaches in a high school in Berlin—travels back to Pfister’s Mill with his young wife in order to spend a month of the summer in the place where he grew up, before selling the property and tearing it down to make room for his friend’s dry cleaning business. 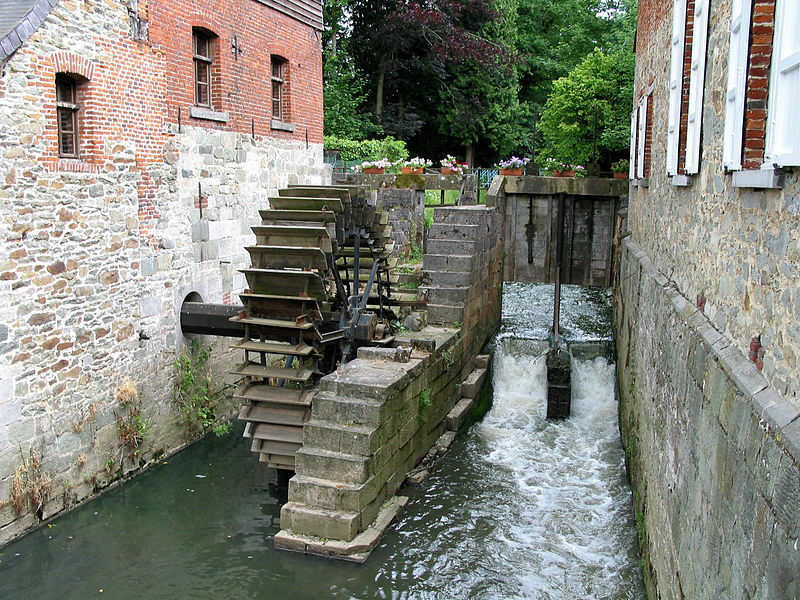 A twelfth-century water mill. Photograph by Jean-Pol Grandmont. I can no longer tolerate being engulfed in this deadly foul smell all the time without doing something up about it… . If there is science and justice, they should work in favor of both of us – Pfister’s Mill and myself – or we will both close down the business. —Wilhelm Raabe, Pfisters Mühle. Ein Sommerferienheft (1884). In Sämtliche Werke, vol. 16, ed. Hans Oppermann (Göttingen: Vandenhoek & Ruprecht, 1970), 258. The foul smell is caused by the algae that are slowly but steadily growing in the stream and covering it like a carpet. The algae are beginning to threaten the father’s mill business and the smell is keeping the customers of his outdoor tavern away, a business he is operating on the side during the summer months for some extra money. Unidentified organisms, including bacteria, protozoa, and algae. Photograph by Janice Haney Carr, USCDCP. 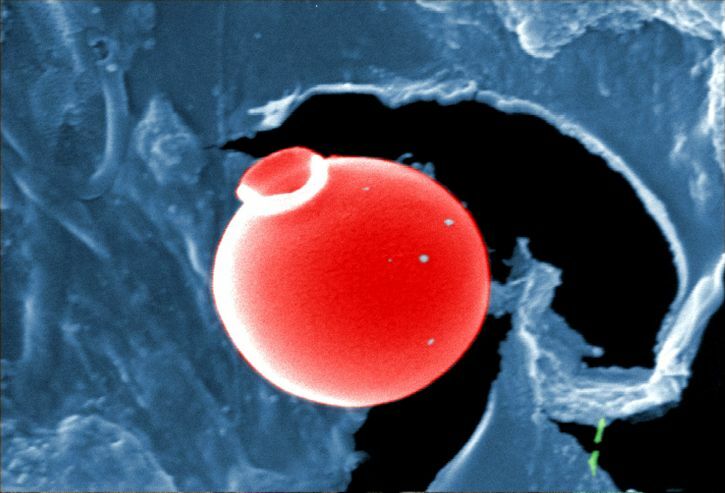 Accessed via PIXNIO on 6 September 2018. Click here to view source. 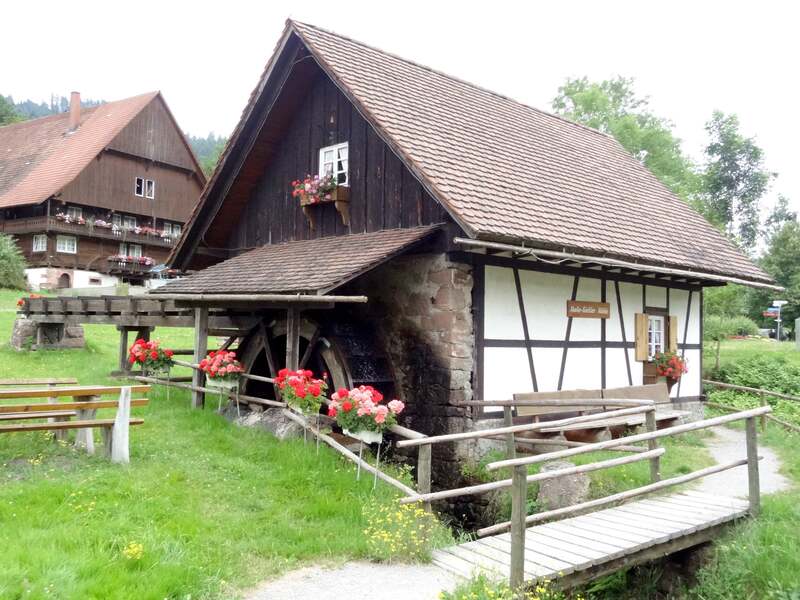 An old mill in Nordrach, Germany. Photograph by Peter Poschadel. Ebert’s childhood friend and mentor Asche, on the other hand, who is a trained chemist and experiments with the chemical processes of dry cleaning, is thinking about opening the first dry cleaning business in town. Asche knows that every modernization process requires some sort of sacrifice in return. A person like myself [Asche] who has the best of intentions of polluting a bubbling spring, a crystalline brook, a majestic river, in short any waterway in the idyllic green German Empire as soon as possible and as infamously as possible, is no longer allowed to say that he would give his heart’s blood in order to keep that good old guy’s mill brook clean! After his father’s death, and after spending an entire month of the summer in the mill writing down the story of its downfall, Ebert decides to sell the business and invest the proceeds into Asche’s newly opened dry cleaning business. In this way, the story has an ironic ending where everyone involved walks away with a profit. 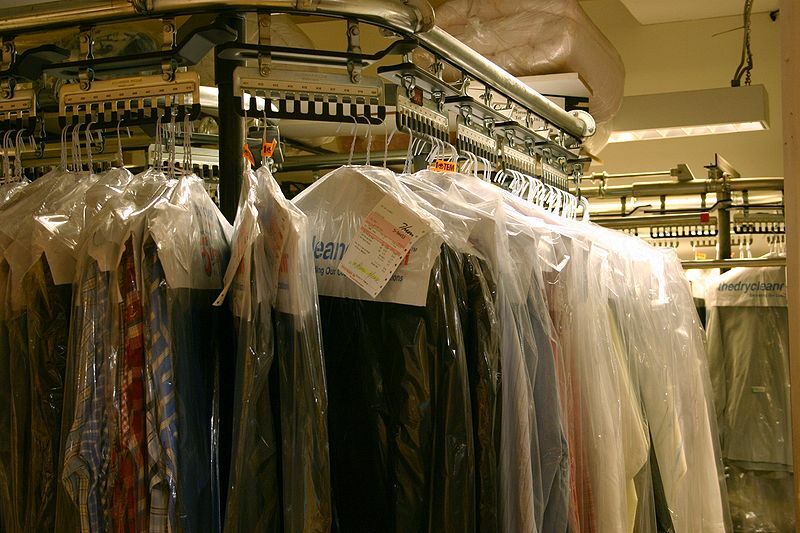 Many dry cleaners place cleaned clothes inside thin clear plastic garment bags. Photograph by Simon Law. In modern German literature, themes of air and water pollution are often framed in terms of images of industrial waste, and of materials that are used in the production processes characteristic of modern global capitalism. A Klee painting named “Angelus Novus” shows an angel looking as though he is about to move away from something he is fixedly contemplating. His eyes are staring, his mouth is open, his wings are spread. This is how one pictures the angel of history. —Walter Benjamin, “Theses on the Philosophy of History” (1940), in Illuminations, ed. Hannah Arendt, trans. Harry Zohn (New York: Harcourt, Brace & World, 1955), 259–60. Plastic containers among water lilies. Photograph by Ryan Hagerty. 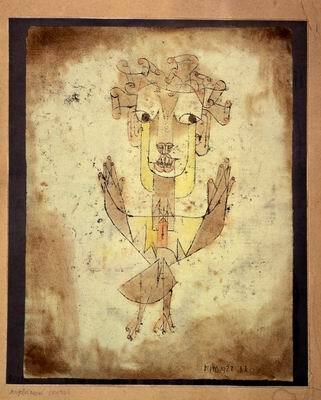 Paul Klee, Angelus Novus, 1920. Oil transfer and watercolor on paper, 31.8 x 24.2 cm. Held by the Israel Museum, Jerusalem. Where we perceive a chain of events, he sees one single catastrophe which keeps piling wreckage upon wreckage and hurls it in front of his feet. The angel would like to stay, awaken the dead, and make whole what has been smashed. But a storm is blowing from Paradise; it has got caught in his wings with such violence that the angel can no longer close them. This storm irresistibly propels him into the future to which his back is turned, while the pile of debris before him grows skyward. This storm is what we call progress. The debris that is building up in front of the angel of history contains the waste of history, and the angel is no longer able to “make whole what has been smashed.” In a departure from common interpretations of this passage that foreground political history, it is productive to connect Benjamin’s theory of history with an environmental perspective. As dead waste, the debris has been separated from the closed cycle it was part of and can no longer be put back together again by the angel. In his apocalyptic vision, Benjamin ties political history to the processes of material production and wastefulness that are at the core of modern consumer societies. In Der Müll, die Stadt und der Tod (Garbage, the City, and Death), a controversial play written in 1975 while he was director of one of the independent Frankfurt theaters, the German playwright, actor, and filmmaker Rainer Werner Fassbinder deals with the themes of uninhabitable modern city centers, and of the human waste created by these desolate landscapes. At the time the play was written, Frankfurt was at the beginning of an enormous postwar German economic development boom. Its Western suburb was remaking itself into Europe’s banking metropolis and financial center, with ugly corporate high rises quickly replacing older and less affluent neighborhoods where people had lived and worked for generations. Fassbinder was part of the squatters’ movement that protested against this development. The controversy over this play, however, had nothing to do with waste, but with Fassbinder’s decision to include a figure in the play that he called “A, the rich Jew” who finances the city’s urban and economic development. This character was modeled after Ignatz Bubis, a prominent Jewish citizen of Frankfurt and leader in Germany’s central Jewish political organization. Consequently, the play was banned from the stage until its first German-language premiere in 2009. The material did, however, make it into a film in 1976 with Fassbinder in the leading role as pimp Franz B. and Fassbinder’s ex-wife, Ingrid Caven, in the role of the prostitute Roma B. Many other well-known German stage actors, such as Klaus Löwith who played A, the rich Jew, and Boy Gobert, who played the mayor of Frankfurt, also took part. 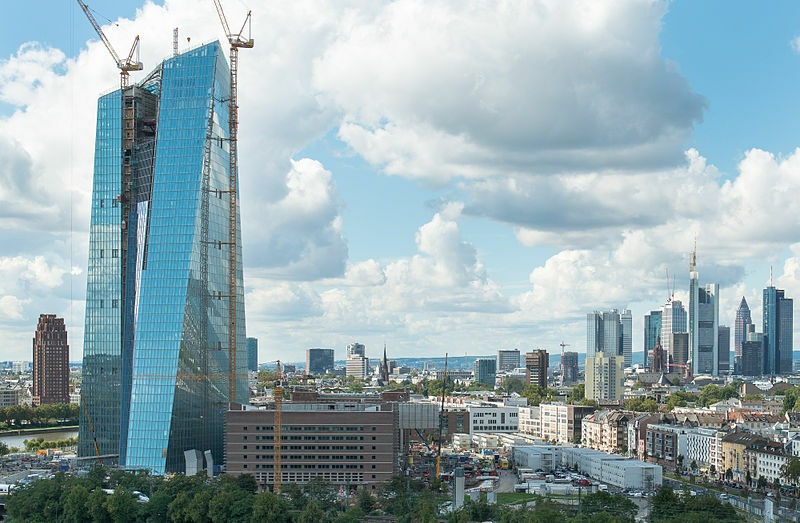 The European Central Bank in Frankfurt. Photograph by Epizentrum. The city is transforming us into living corpses, figures from a horror movie without the proper cabinet of horrors, existing at below-grade living conditions, with streets that poison us where we can still be poisoned… . I don’t want to live that kind of life anymore, God. I want to give it to someone else, want to make myself into a victim, for the city’s sake that needs victims in order to seem alive, and last but not least in order to save myself, i.e., save myself from death in a life that makes me equivalent to those who forgot what life is, those who have become dull and speechless and who figure they are happy and forgot that they are not and who no longer grow teeth with which they can defend themselves in the jungle. —Rainer Werner Fassbinder, Der Müll, die Stadt und der Tod, Nur eine Scheibe Brot (Frankfurt 1998), 85-86. 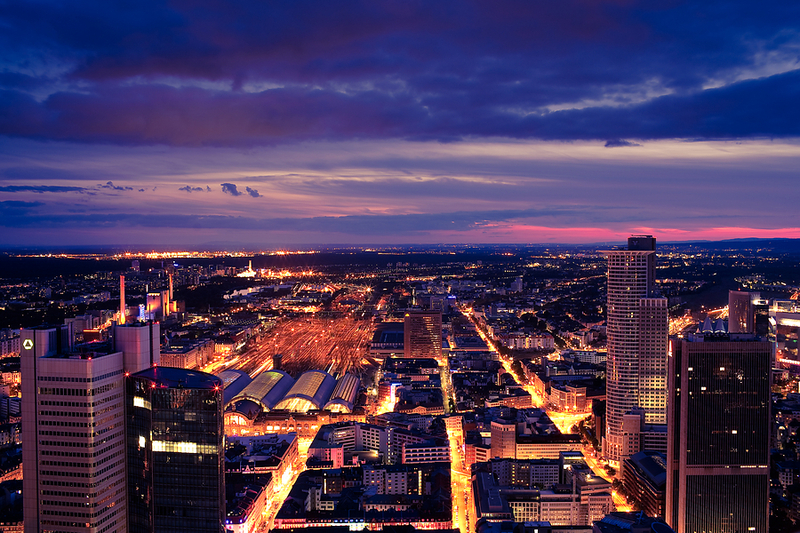 Frankfurt am Main by night. Photograph by photomek. The characters in Fassbinder’s play figuratively stare at a mountain of waste that is constantly growing, not unlike Walter Benjamin’s angel of history, who is staring at the pile of debris and would like to stitch the pieces back together again to no avail. Fassbinder’s play works as an allegory for a planet that has become uninhabitable, where the remnants of a murderous social system and a system of production that generates waste are piled up high and cannot be stitched back together again. 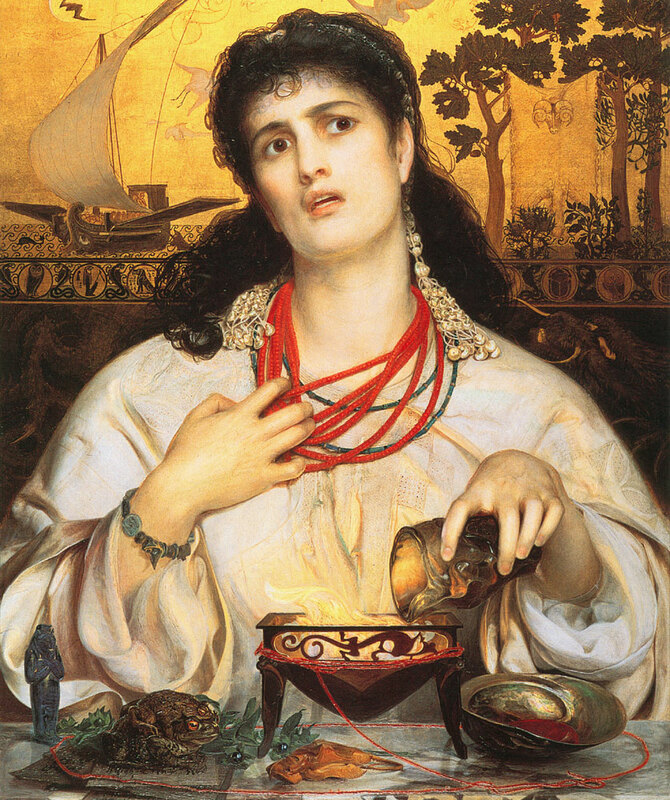 Anthony Frederick Augustus Sandys, Medea, 1866–68. Oil on wood, 61.2 x 45.6 cm. Held by Birmingham Museum and Art Gallery. In his 1983 postmodern Medea play, Verkommenes Ufer Medeamaterial Landschaft mit Argonauten (Despoiled Shore, Medea Material, Landscape with Argonauts), the GDR playwright, director, and poet Heiner Müller transplants the story of Medea from the North African desert and the Mediterranean shores to the shores of a polluted lake just outside Berlin. 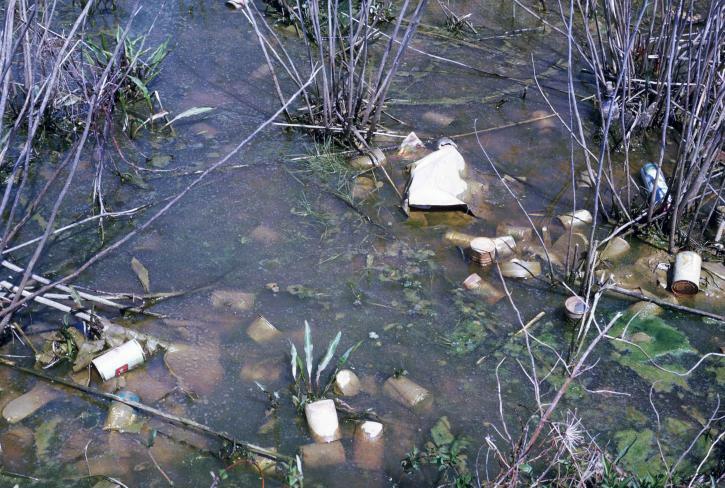 The shore of the lake is dirty, and the lake itself is totally polluted with garbage (including used tampons, empty bottles, and even parts of human corpses). At the end of the play, Medea lies at the bottom of the lake, holding the pieces of the hacked-apart Brother in her arms, in an allegory of the destructive future of Western civilization viewed from an East German perspective. It is important to acknowledge that Müller’s critique of Western civilization, and the impasse of the Cold War, is tied to a critique of contemporary production processes and consumption habits, which are also at an impasse. In Medea Material, Müller’s Medea asks Jason to leave her the children for one more day, after which she promises to return to her desert. Landscape with Argonauts is a short scene in which the landscape is littered with garbage. In Müller’s play, this landscape full of waste literally becomes a dramatic character, and, like a chorus, it speaks in the first person. The trick Müller is applying here is that the scene presupposes the (environmental) catastrophes enacted by mankind. A lakeside polluted by garbage and wreckage. Photograph by USFWS. 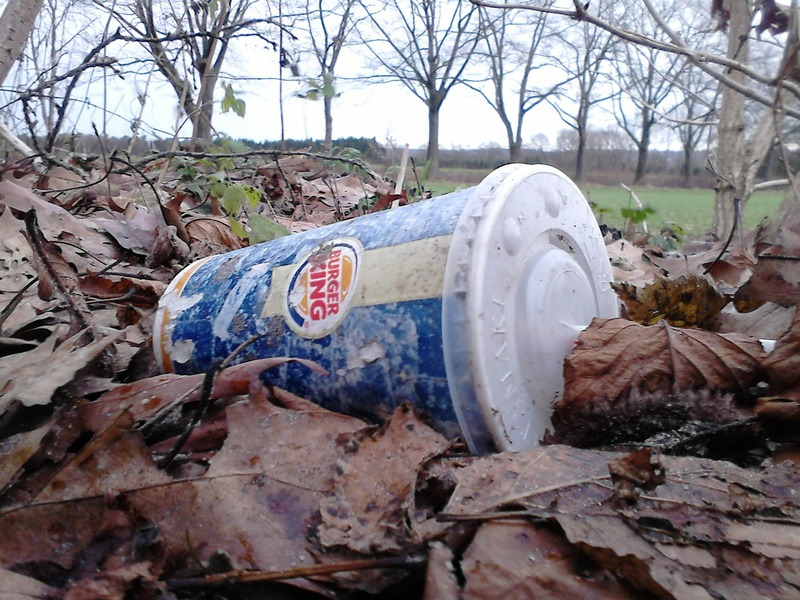 A fast food container in the forest. Photograph by Netzschrauber. —Heiner Müller, Hamletmachine and Other Texts for the Stage, ed. and trans. Carl Weber (New York: Performing Arts Journal Publications, 1984), 133–34. Heiner Müller’s theatrical legacy is the use of the “synthetic fragment” structure in his plays, which rethinks the didactic model of theater that he learned from Brecht. In Müller’s play, this landscape of waste becomes a synthetic fragment in which waste is reintroduced into daily reality, but as debris of waste and hastily stitched back together, a process that Walter Benjamin’s angel of history was no longer able to perform. With the help of the synthetic fragmentation technique, the readers and spectators of the scene are forced to look at and acknowledge the garbage that their society and consumption habits have produced. As a synthetic fragment, the polluted landscape becomes estranged and, in the Brechtian fashion, demands reflection on the causes of this pollution. A cooling tower emitting steam. Photograph by Ryan Hagerty. Christa Wolf, a writer from the GDR, engages with the theme of nuclear pollution in her 1987 narrative, Accident: A Day’s News. In this tale, as she listens to the local radio station, Wolf painstakingly records her reaction to the news about the nuclear accident in Chernobyl, which unravels over the course of a day in April 1986. The narrator finds herself alone in her country retreat in rural Mecklenburg outside of East Berlin, trying to come to grips with the news of the accident. At the same time, she is waiting to hear the results of her brother’s brain surgery, which is also taking place that morning. The narrative connects her critical reflections on nuclear technology to her faith in medical technology in complex and interesting ways. The first mammals presumably developed around two hundred million years ago from mammal-like reptiles in the battle over ecological niches—a way of existence crucially dependent on hearing and smell, senses of distance which were thus treated to preferential development. A few branches of the vertebrate family tree led to dead ends. It remains to be seen whether that branch which resulted in the human being will also lead to a dead end. —Christa Wolf, Accident: A Day’s News, trans. Heike Schwarzbauer and Rick Takvorian (New York: Farrar-Straus-Giroux, 1989), 44–45. How strange that a-tom in Greek means the same as in-dividuum in Latin: Unsplittable. The inventors of these words knew neither nuclear fission nor schizophrenia. Whence the modern compulsion to split into ever smaller parts, to split off entire parts of the personality from that ancient being once thought indivisible … No surgeon could penetrate through to that hectic group of neural connections in the brains of those men who thought up the procedures for the so-called utilization of energy. Wolf’s narrator suggests that there is a connection between physics and the make-up of an individual personality, and therefore between the principle of energy and the psychological make-up of a split personality. The human being becomes an evolutionary cul-de-sac, in which desire is motivated by violence. Highly gifted, very young men who—driven, I fear, by the hyperactivity in certain centers of their brains—have not signed a pact with the devil (oh, brother! The good old devil! Would that he still existed! ), but rather with the fascination with a technical problem. Literature is able to counteract this development by focusing on this violence, visualizing connections between parts, and exploring what Wolf calls, in reference to Joseph Conrad, the heart of darkness (the modern inclination to split everything into smaller parts). 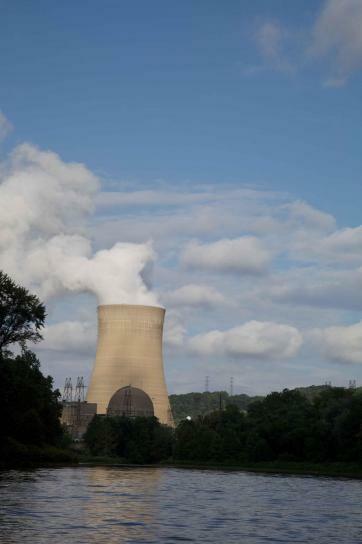 Nuclear pollution is the consequence of this principle gone haywire.